It’s no secret that I’ve been trying to eat less meat this year. I’ve found it easier than I expected honestly, but I’m always on the look out for quick and easy veggie meals that are packed full of flavor. 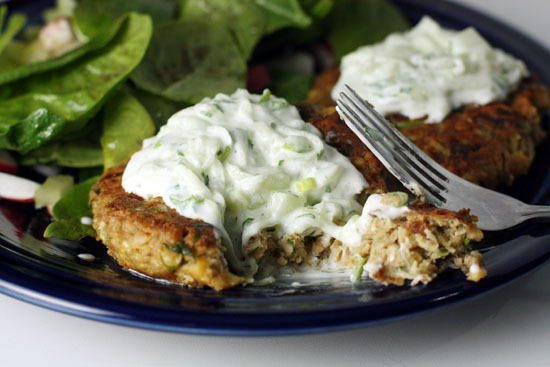 That’s exactly what you’ll get from these chickpea patties. The alternate name for chickpea patties is Falafel on Steroids. But really they don’t taste that much like falafel other than the fact that they are made from chickpeas (Garbanzo beans depending on where you’re from). Served with a simple salad, these are a great dinner. There are two parts to this meal that make it special. First, the garam masala. It’s fantastic and I doubled it for my version over the original recipe. Second, the greek yogurt sauce is very good. One of the better versions I’ve had. Also, this looks like a decent list of ingredients, but there’s a lot of duplicates actually so it’s really easy to prep if you do everything at once. 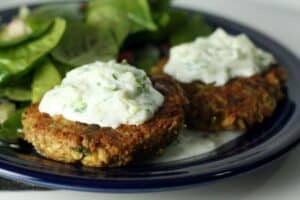 Chickpea patties lightly fried and topped with a tangy homemade yogurt sauce. Serve them as-is or as veggie burgers. 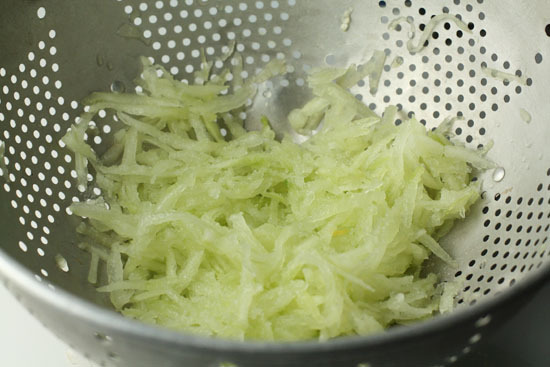 1) For the yogurt sauce, seed your cucumber and then grate it through a box grater into a colander. Add a sprinkle of salt and let the cucumber sit for 10-15 minutes. 2) Dice other yogurt sauce ingredients and combine with cucumber. You could make this in advance. 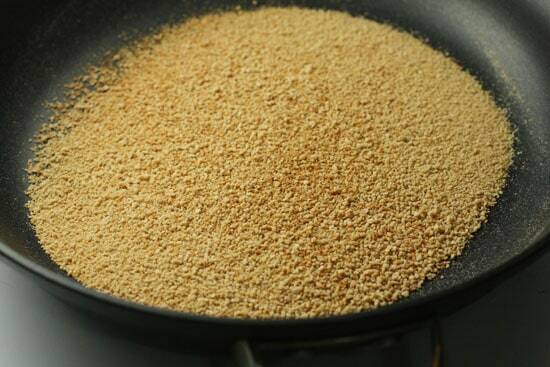 3) For patties, toast breadcrumbs in a dry pan for five minutes until they are lightly toasted. 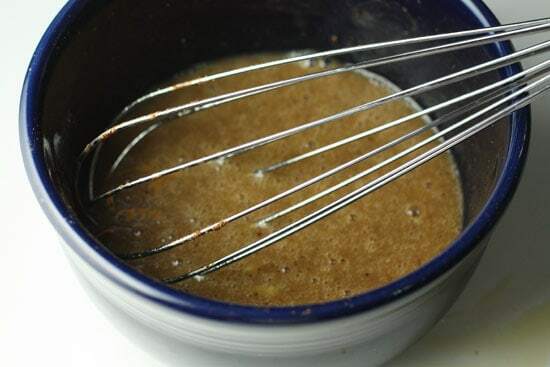 4) Whisk together eggs, garam masala, oil, and a pinch of salt. 5) Add your drained chickpeas to a large bowl and mash them with a fork or masher. You could also pulse them lightly in a food processor. 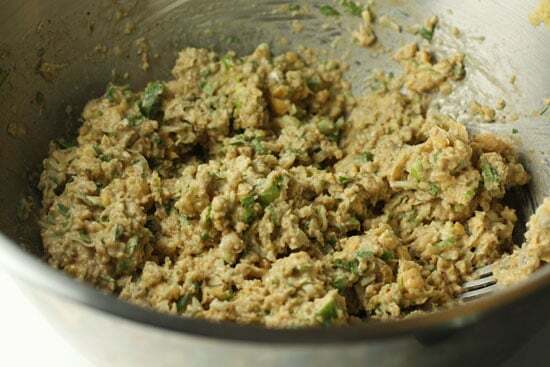 6) Stir the egg mixture and breadcrumbs into the chickpeas and mix well. Also stir in other ingredients (yogurt, scallions, cilantro). 7) Form eight even sized patties with the chickpea mixture. 8) Cook patties in a pan with a drizzle of oil over medium-high heat for 4-5 minutes per side. They should be nicely browned on each side. 9) Serve the patties with the yogurt sauce. Adapted from America's Test Kitchen 30 Minutes Suppers. The next time I make this, I’m going to make a double batch of the sauce. It would be so good on pita as a snack or on a ton of different sandwiches. In all seriousness, I could eat it with a spoon. The only hard part (and it isn’t that hard people) of making this particular tzatziki recipe is shredding the cucumber. Sometimes I like it chunkier, but shredded was nice for this version. Basically, just peel your cucumber and scoop out the seeds with a spoon. Then shred it into a colander using the large holes of a grater. Sprinkle a pinch of salt on the shredded cucumber and let it sit for 10-15 minutes. It’ll lose some moisture so you may want to set it over a bowl or a few paper towels. 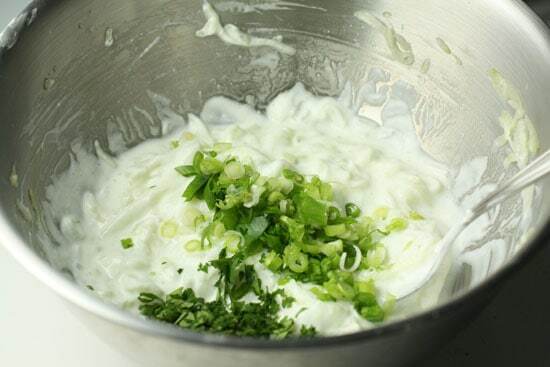 Once your cucumber is ready, just mix up the rest of your tzatziki ingredients in a big bowl. It should be pretty thick. Take your time chopping your ingredients evenly so you don’t get a big bite of scallion or something. This will keep fine in your fridge for a day or two or probably longer but it won’t last that long. These patties are pretty easy to make and while the original recipe only makes 6 patties, I was easily able to get 8 good sized ones from the recipe. That’ll give them a slightly nutty flavor and also help them absorb even more moisture. 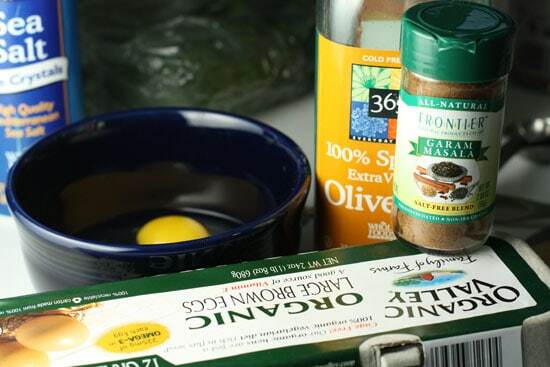 Next, whisk together your eggs, garam masala, oil, and pinch of salt into a small bowl. It’ll look strange, but smell really good. Add all your drained and rinsed chickpeas into a large bowl and mush them up with either a fork or a potato masher. I used a fork and left mine pretty chunky actually. You could make it smoother if you wanted, but I’m lazy. A fork is your best bet for this. Then stir in your egg/spice mixture, breadcrumbs, and all the other ingredients. You’ll end up with this very thick paste of sorts. Again, it doesn’t look great, but it’ll smell really good and trust me it’ll taste good also. I realize this does not look appetizing. Forming the patties is straightforward enough. Just divide the mixture into 8 (or 6) equal parts and then form round patties out of the mixture about 3/4 of an inch thick. Try not to press the mixture together too much. Keep it light. 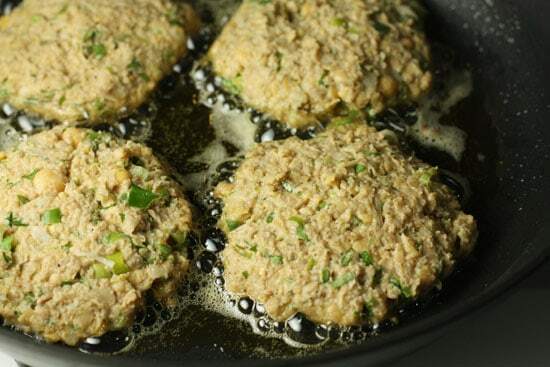 Then, in a pan over high heat, add 2 Tablespoons of olive oil and when it’s glistening, add your patties. You’ll probably have to work in two batches unless you have a really big pan. Four to five minutes per side and you should end up with these lovely, browned patties. I served mine with a small salad and a good amount of the yogurt sauce. Very tasty! Would also be a good veggie burger! As soon as I took a bite of this though, the first thing I thought of was veggie burgers. These would just rock as burgers. The burger route opens up a lot of options. Have the patties with a salad for dinner and then take one or two burgers for lunch the next day! These are versatile and delicious little things. I didn’t miss the meat for a second when I was done eating them! Looks very good. I'll definitely try this. I have, but canned is fine for this recipe. There's a lot of other stuff that goes into the patties. i just made it and it's delicious! i think it would be a really hearty, delicious vegetarian meal. and they eat it in morocco, so it's not just for wintertime! Awesome! Thanks Kate ;) I've been meaning to try a tangine for awhile now. Awesome! You can't go wrong with any of these ingredients. Will definitely bookmark to try! i so want to try these and deep fry them in peanut oil. nice job. wow these look delicious…i wish i was having these for dinner right now. Cheers! I love this, first thing I thought when I saw this was how much of it I could get from my farmer's market, which always makes me happy. The other thing I noticed was that I have the same colander! I inherited mine from my grandmother, and just thought it was a strange coincidence to see the same one on le internet. Have you tried making these gluten free? If so, what did you use as a substitute for breadcrumbs? You can also use cornstarch. Cornstarch is gluten free if it is pure. Check the label. If you want to add filler, leftover rice is a good option. Hey – made these for dinner! They look great, but I struggled to keep the structure of the patties – they fell apart a bit. Any suggestions for preventing this? Also, added cumin to the egg mixture, worked nicely. I think this probably means that your mixture is a bit on the dry side. 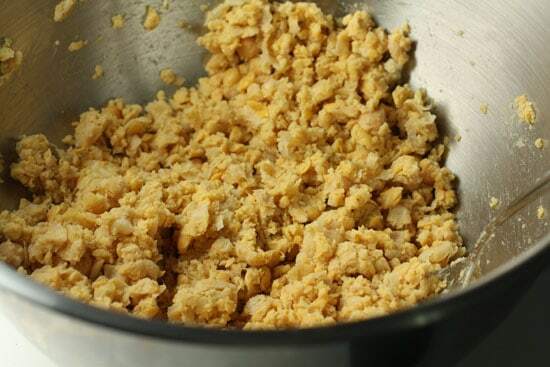 You might try adding another egg to the mix or another 1/4 cup of yogurt, then add a extra handful of breadcrumbs. That should keep them together better. Good luck! Help! I’m making this dish tonite. Do I mix the 1/2 cup of greek yogurt in with the garbanzo, oil, egg, breadcrum mixture before sauteeing in the pan? I can’t wait to make these!!! They look amazing. Hey Tina! Sorry for the not quick reply… I was watching Hugh Jackman sing at me. Anyway, yes. There’s two measurements of greek yogurt. One for the topping and one fo r the actual patties. It just keeps them from drying out as they cook. Good luck! Thanks so much for geting back to me Nick. I made the recipe this evening, and I was able to figure out the yogurt question from your response to a previous post. My husband, 15-year old daughter, and I loved the patties. My 11 and 12 year olds will need some more experience with it before they love it as much as the rest of us do. I will also try serving them on a bun like veggie burgers, and see how the younger kids like that. I thought the yogurt/cucumber sauce made the dish! I could even eat the yogurt/cucumber sauce straight out of the bowl….it was that good! I like things with a bit of a kick, so next time I’m going to experiment with adding a small amount of jalapeno to the patties. I have to be careful with how hot and spicy I make things because of my kids. The older one tolerates spicy well, but I’m still working on getting the younger ones to like spicy foods. I must have made the patties really small because I got 12 patties out of the recipe. I’ve been looking at other recipes on your web site and I’m looking forward to trying some others, esp the tempeh tacos. P.S. BTW, I served this dish with a side of Brussels sprouts. I cut sprouts in half and par boiled for a few minutes in 1/2 inch of water. Drained the remaining water and then sauteed with butter and finished with a generous amount of kosher salt (I love salt!). This was just a great dinner. I am definitly adding the patties to my dinner repertoire. Nick: I would love to try this recipe sometime this week but forgot to buy eggs. Do you know or any other readers know if this recipe would work using the flax egg substitution? Thank you! I think it probably would Connie. You just need something to act as a binder. I don’t see why it would have to be eggs specifically. Cool Laura! Thanks for the comment and I hope they turned out okay. :) Cheers. Can you use dried chick peas soaked overnight? Would I need to then boil them too? Hey Jennifer, you absolutely can use dry chickenpeas but yes. You would want to soak and then boil them first before using them in the recipe. Good luck! Hi! Just wanted to let you know I prepared these today and my husband and baby loved them. Just think I added too much bread because they were a bit dry. Will definitely try them again. Thank you for sharing! Really glad you liked them Ana! Thanks for the comment! Hey Cathy! Yep. They freeze great. If you freeze them before cooking, I would probably thaw them before cooking them so they cook evenly. You could also cook them, cool them, and then freeze them though and then just reheat them when you were ready to eat. Should be great either way! Good luck! 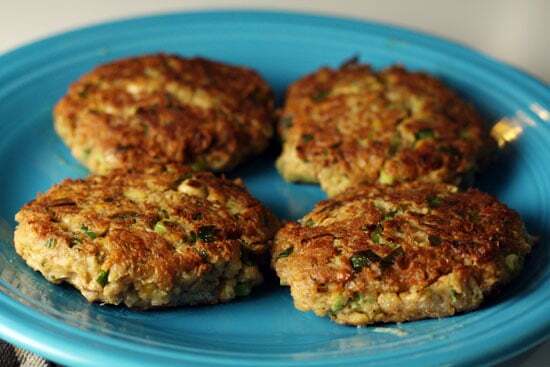 Just made these great chickpea patties. Thanks for the recipe. Enjoyed the explanation and pictures and the funny comments (“I’m too lazy to mash them up more””, that actually helped me not become so tired at mashing them up.) I think I will add another egg as you suggested because they seem a little dry. Apparently I missed adding the yoghurt in the mixture as well. I made my own garam masala mix but I store bought the Tzatziki. I still feel like it lacks something, so I might add it a little garlic and a little more onion (as I didn’t have scallions). But thanks again for this recipe, not too labor intensive and a good substitute for meat. I”ll make these this fall with pumkin/squash ou carrot soup. Merci!